For the fourth and final topic in our LinkedIn partner blog series—“The New Face of Today’s Hourly Worker”—we’re tackling hourly employee promotion and career advancement. In Part 3, we uncovered the job skills that best predict future managers. Now, we’re taking that data a step further to look at how you can create a solid employee promotion culture at your organization that gives your recruiting and retention efforts a significant boost. But first, when it comes to how quickly employees get promoted to manager, how does your company stack up? Snagajob and LinkedIn analyzed career progression data from 20+ million hourly workers to find out. Which industries are best for hourly employee promotion? Employee promotion time—or, the amount of time between an employee starting a job and getting promoted to a management position—varies from about 20 months to just over 3 years by industry. Career progression in the beverages industry is the quickest, followed by fast casual, sandwich and pizza restaurants, where it typically takes just over 2 years for employees to get promoted to managers. 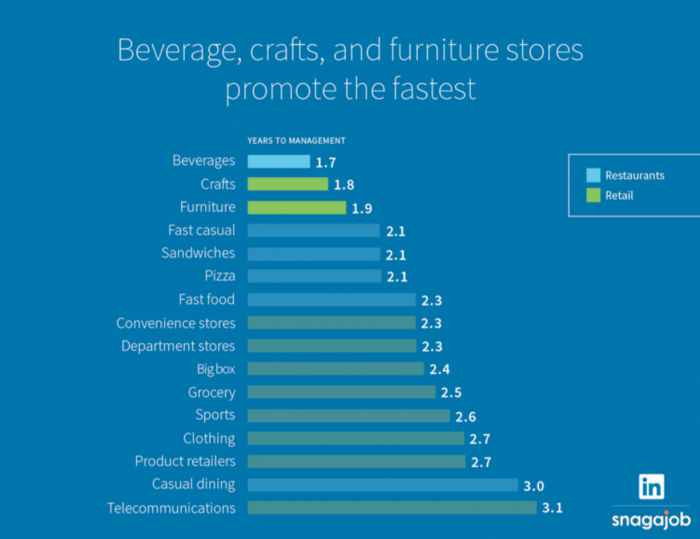 Among retail subindustries, craft and furniture stores offer the fastest career advancement track for hourly employees; here, employee promotion to management averages about 22 months. Understanding which employees are interested in becoming managers one day and building out a basic career development plan to get them there gives top-performing, high-potential workers a clear path for career advancement … and a reason to stay. Here are three simple steps to get started. Hourly workers are interested in being promoted. According to our 2017 State of the Hourly Worker Report, 84% of hourly workers find opportunities for growth in a job important. So it’s vital for employers to recognize employees who show management potential early and set them on the path for employee promotion. Think about who your star performers are and discuss where they see themselves in 1-3 years. Prepare your high performers by giving them increasing responsibilities at your business. This is how they’ll get a taste of what it’s like to manage a business, from accounting and finance, to forecasting and scheduling. Even if you don’t have a formal training program in place, you can begin to teach employees about different aspects of the business to see if they’ve got what it takes to someday become a manager. Whether it’s a scheduled meeting or a casual conversation, communicating often about your employees’ satisfaction can contribute to retention and ensure that they feel like they’re being heard. It’s a great way to get feedback about how you run your business and answer questions they have about their own career path. Engaging your employees week after week can help put them on the right path for employee promotion to management—which sets up both your people and your business for long-term success. We analyzed Snagajob’s job application activity to its top 142 employers over the past three years. This was comprised of 120 million+ applications by 20 million+ hourly workers. For age and education, we analyzed the total Snagajob database. (Note: education results exclude the 2% of applicants with unknown education.) We then examined the millions of LinkedIn profiles with common hourly job titles to learn more about hourly workers. The results represent the world seen through the lens of Snagajob and LinkedIn data. As such, it is influenced by how LinkedIn members choose to use the site, which can vary based on professional, social, and regional culture, as well as overall site availability and accessibility. These variances were not accounted for in the analysis.